This necklace is looking very beautiful. I really like its design. I wana purchase it for myself but in white color. Will you provide me the same necklace in white color. It was rather interesting for me to read this post. Thanks for it. I like such themes and everything that is connected to them. I would like to read a bit more on that blog soon. I love necklaces and accessories which combine different ethnic elements. 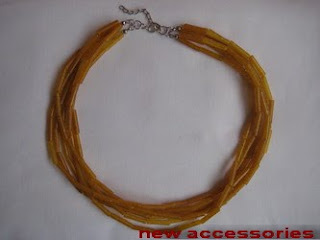 This amber-coloured necklace looks like African braclets and can be easilt combined with a long skirts.